Vinyl Soft Play Area Products - We offer vinyl soft play infant and toddler climbers designed to promote gross motor skills in a safe, soft environment, made of dense virgin polyurethane foam that meets all US and European Flammability requirements. Designed for ages 6 months to 3 years. Perfect for Play areas and more at Hotels and Resorts, Daycares, Home Use and more. We offer vinyl soft play infant and toddler climbers designed to promote gross motor skills in a safe, soft environment, made of dense virgin polyurethane foam that meets all US and European Flammability requirements. Designed for ages 6 months to 3 years. CF321-323 - LILY PAD LANE - INCLUDES SECTIONS A, B. Additional items shown also available. CF332-578 - SUNNY MEADOW MIRROR - 20" x 40" - shown horizontally and vertically- graphics are silk screened on back of mirror. made of PET - hardware not included. Perfect for testing spatial relationships. Cushion bold toddler explorations and protect chubby hands and knees. 24” long soft tunnel with 14” diameter removable cylinder. 4” soft sides. Soft race car shapes for crawling over, pulling up, around, toddling into, or just sitting. (Set of 3). 10” h x 24” l x 15”w. Fundamental climbing piece for crawlies through 2’s. Wipe clean surface over crushable foam shapes provides tummy tumbling developmental fun through play exercise. 2 bumps 6” high and one 12” high bump together form one soft unit. Pastel and Primary. Two soft shapes initiate early gross motor play in 6 months old thru 2s. Expanded vinyl soft covers encase firm foam with hook n loop strips on bottom for easy attachment. 10" high. One piece soft shape joins edgeless soft steps with a safe platform and gentle ramp inviting crawlies through 3’s to pull up, venture, and succeed. Patterned Naugahyde® with anti-slip floor surface. 20”W x 42”L x 12” H.
Crawl in and discover 6 different sensory surprises, featuring a 9.5" x 9.25" sewn-in mirror, a squeaker, 4 beads, a bell, and two colorful tactile shapes. The other three walls have cut outs for crawling in, out, around, and through! Exciting learning experience for ages 6 months through 2s. Measures 24"w x 36"l x 24"h with a 3" thick floor. 14 oz. vinyl laminate is easy to wipe clean. 4 piece climbing unit for ages 6 months through 2 years. Universal hook & loop attachment allows the walnut brown and almond tan expanded vinyl foam pieces to be used in different configurations. A colorful seven-piece center of the room climber. Perfect for 6 months thru 2s. Unit attaches together with hook n loop fasteners. Colorful petals vary in height from 3"h to 9"h. Floor space 64"diameter. Beautifully colored 3 piece set is perfectly sized for ages 9 months thru 3s. Stimulates imaginative play. Large red/orange archway has an opening 11.5"h x 24.75"w. Unit measures 36.75"l x 15"w x 17.5"h.
Award winning play system offers 6 months old thru 2s a cozy safe play environment. 8" h playring surrounds secure area, prevents toppling, provides hidey holes, squeakers and bells for sounds, wood shapes, and pockets for saving special things. Use 2 pieces separately, hook n loop ring together or fold up and carry away. 36" Diameter. Softly interactive crawly haven for active 6 months old thru 2s. Nine separate shapes fasten together in a softscape play area. 8"h sides aid in pull ups, sit downs, or enfolding babies. Squeakers, bell, and mirror, plus loops for add ons to stimulate learning and fine motor exploration. Drop in 1" thick foam floor covered in wipe clean vinyl. Five Piece climber made of 14 oz. reinforced vinyl for ages 6 months through 2's. Perfectly sized for the newest crawlers. 40" x 40" x 10"high. Climber pieces attach together with hook and loop fasteners. Versatile climber can be placed in a corner or in the center of a room. Three foam covered expanded vinyl shapes to enhance spatial awareness for the 6 month old thru 2s. They can manipulate their environment as they crawl thru, flip over, nest in or align end to end. Round tunnels 20"w x 10"d x 15"h. Square tunnel 20" x 20" x 15". Seven unequal soft shapes Velcro together in an age appropriate gross motor softscape for crawlies through 3’s. Hygienic wipe clean vinyl coated nylon covered foam geometric shapes encourage large muscle development. Notched pinnacle allows tight nestling and tender tumbling. MUST BE USED IN A CORNER FOR SAFETY. 50" corner square floor space needed. 18" high peak. Just the right size for crawlies to age 4. Nine separate soft foam shapes Velcro together in a roller coaster of safe play. Cantilever sides ensure stability. Different heights and widths safely challenge these ages. 72”l x 40”w x 18”h. Side Safety pad not included. Under, over, around and through! 27” high twin tunnel climber sized for toddlers through 3’s. Double spiral staircase platforms lure little legs up and down brilliantly colored climber. Must be placed against wall for safe play. Wall floor space needed. Ten foam shapes, Naugahyde® encased, with anti-slip bottoms promote the intermingling of parts into intricate or free-form patterns. Sized for 9 months to 3 years. Floor space 60" SQ X 18" H Mirrors sold separately - Click here to see Mirrors. Nine soft shapes with equal sides to nest along one, two, three, or four sides. Hook n loop strips on bottoms promote attaching into new combinations. 15" high. Sized for 6 months old thru 2s. 12 sided, 12" high, size appropriate center for 6 months thru 2s. 19 individual pieces have interactive hook to form a 7-1/2" diameter center of the room climber that stimulates imaginations. 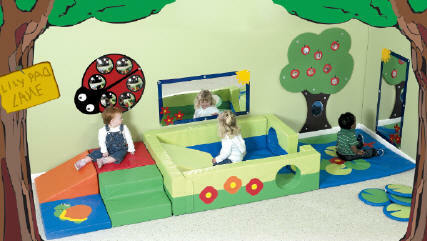 28 super soft safe play forms sized for crawlies up to 2 plus years. Naugahyde® encased foam shapes with anti-slip bottom surfaces all fit together in increments of 5, 10, 20, and 30 inch modules. Provide room and tiny architects shape their gross motor parameters. Simple shapes build never ending play possibilities. Pieces may be purchased separately or in smaller units also. NOT EXACTLY AS SHOWN - RED SECTIONS ARE PLAIN RED - NO PATTERN.